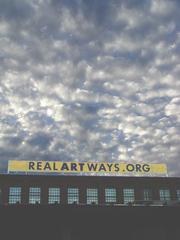 Founded in 1975, Real Art Ways is one of the country’s leading contemporary arts centers. Real Art Ways presents and produces new and innovative work by emerging and established artists, and serves as a crucial connection for audiences and artists regionally, nationally, and internationally. The organization has sustained itself through committed support for new ideas and disciplines, and has steadily built a diverse and unique audience that crosses lines of color, sexual orientation, economics, and age.